As Jennifer posted earlier, today is the first official day of summer in our little town! Yesterday was a terrific last day of school at the Garvey household. Kailea had a little school’s-out get together with friends, and Collin and his friends celebrated the end of the school year with an early dinner at Steak and Shake. So…we’re off to a good start and already have a couple of bucket list items we can check off! Fun. I have the typical working mom’s dilemma: love summer schedules and the ease in the routine but feel guilt about being at the office while they will be home. They will be home with Grandma while I work. I want them to have a fun and productive summer but don’t want to overwhelm my mother-in-law with my agenda of what I think that should look like while I am at work. Would love to hear other thoughts / recommendations. I really connected with Jen’s question, because as a full time working mom myself, I can totally relate to the guilt that comes from being away from my kids during the summer months. With my kids, we are away from each other mentally and emotionally during the work day, even though physically we’re in very close proximity. The way I have made peace with this over the years, including when my kids were babies and in daycare, was by knowing that when I am true to myself and do what my heart and soul call me to do, it is the absolute best choice for everyone. My heart and soul have always called me to have a career and so that’s what I have done. Are there trade-offs? Absolutely. But there are trade-offs in any decision we make. Regardless of how you get to the decision about working outside of the home or not, whether it is out of choice or out of necessity, once the decision is made—give yourself permission to let go of the guilt. You and your children will have different benefits and challenges than someone who made a different choice, but your kids will have great childhood experiences and a wonderful summer—either way. What I try to do during the summer is make the most of my time with my kids when I’m not working. One way that I do this is to get them to help out with basic household tasks such as cleaning the house, doing the dishes, cleaning up the kitchen after dinner, and putting away the laundry. I remind them that the more they do to help me with stuff that needs to get done, the more time I will have to do fun stuff with them. This way, when I’m not working at simplify 101, I have more time to spend with the kids doing those fun bucket list items. We have two active girls (9 & 11). I started working this year after 11 yrs staying at home. We can hardly wait for weekends and holidays (to me it is time to get things done that didn’t get done during the week). My children are convinced that I do not understand the meaning of the words “holiday” or “vacation” because we are always cleaning or sorting…BORING! They do each have a weekly chore schedule and are a big help. I would love to just have a fun summer with my kids for a change but the guilt of trying to finish unpacking after 2 yrs bothers me. It seems we don’t have enough time to finish unpacking (and the realization of how much we stored in our garage in our last home…eek! We don’t have a garage or the built in cupboards that we used to have.) I’m stuck in a cycle of unpacking, sorting, not knowing where to put things and NO FUN! =( There is no balance in our family right now. This is another really great question! I’m so glad you asked it Teresa. It sounds as if your stuff right now is stealing your peace of mind and your ability to truly enjoy time off from work. Here’s a really important thing to keep in mind about the stuff that you can’t find a home for: If it has been in boxes for two years this means you haven’t been using it for two years. How much of it do you really need? And, if you were to let it go, what would you gain in the process? Only you know for sure what you would gain, but I would venture to guess that time, peace of mind, and the ability to really enjoy time with your family, would be at the top of the list. So often when we let things go we think about what we’re giving up, but what if you shift that focus to what you will gain in return? Here’s something for all of us to consider: Summer is no time for guilt. Let’s make a pact to let it go this summer. Whether you feel guilty because you’re working while your kids are at home, or you feel guilty about unpacked boxes, or other unfinished projects—guilt isn’t productive. It just makes you feel worse. Instead of feeling guilty about something you can’t change, focus on what you can change. And then go change it. In the case of the unpacked boxes, what if you divide your time off of work between unpacking (and letting go of stuff you don’t need) and enjoying fun time with your kids? Decide to go through a certain number of boxes per week or spend a certain number of minutes on weeknights and weekends chipping away at those boxes. If you tackle this project in small bits of time, and give yourself permission to have fun while there are still boxes to be unpacked, your entire family will enjoy the summer more—and you can spend it guilt-free. You’ll know you’re carving out time for a project that is getting under your skin, but more important, you’ll be spending time with the people who matter most to you. Alright friends, I’d love to hear from you. Is there something you’re feeling guilty about as you head into the summer? Are you ready to let it go? Summer is the best time to go outdoor and have fun. 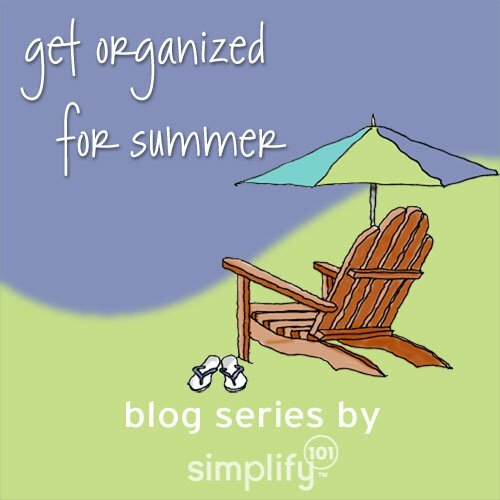 Enjoy the outdoor activities or start organizing things at home, remodelling, painting, etc. Anything you can think of can be a fun activity to start you summer. This post madem e think of our garage. We moved in with my mom about 4 years ago. Becuase I was pregnant and having some issues, my husband’s family cam eone day, packed our apartment and moved everything here. I supervised the unloading to a degree, but many things stayed packed up becuase the boxes were put in the worng section of the house. I have known for years that there is “good” kitchen stuff out there. I also know that soem cardboard boxes got ruined. But to this day I have neither the energy nor the will to go through it – I’d rather play with my son, and he is a curious boy who won’t stay out of teh garage. My mom and I were discussing it again today. And when we got home, there was my husband cleaning out and organizing the garage! We have thrown so much away, got boxes ready for goodwill, and found a few missing treasures. This is an amazing gift he has given me – one less thing to feel bad about. And I am happy to longer have that “good” stuff niggling at the back of my mind! To Teresa I would say do one box per day of unpacking and then stop ! On the MIL question, I find it’s easiest to put it out to the other person first. What are your goals with the kids this summer? Yes, this is open ended and could be answered very broadly, but it could be a conversation starter with the opportunity to work in your input. Then come back with a written plan or calendar and make it easier by saying, based on our fun conversation about the kids’ summer, I thought I’d just jot a few things down because I don’t want something great to be forgotten.